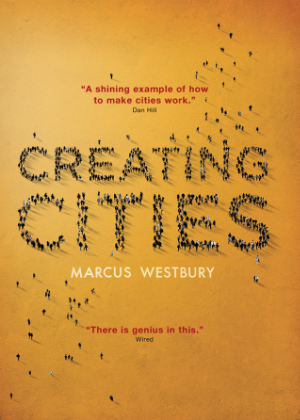 Marcus Westbury’s Creating Cities (Niche Press), a book about the transformation of the city of Newcastle, has won the 2016 Most Underrated Book Award (MUBA). The winner was announced in Melbourne on 11 November as part of the Small Press Network’s Independent Publishing Conference and received a $500 cash prize from award sponsor Booktopia. It was chosen from a shortlist of four that also included: The Floating Garden (Emma Ashmere, Spinifex Press), Clancy of the Undertow (Christopher Currie, Text) and A Man Made Entirely of Bats (Patrick Lenton, Spineless Wonders). The panel of judges, which comprised author Toni Jordan, bookseller Megan O’Brien and Radio National’s ‘Books and Arts Daily’ producer Sarah L’Estrange, said Creating Cities was ‘a wonderful book on two levels’. ‘At the centre of the story is Westbury himself, and his journey from “technically unemployed” prospective bar owner to founder of Renew Newcastle. On this personal level the book is a narrative, unpicking the motivation, challenges and frustrations Westbury and his colleagues experience in their initially naïve drive to find better uses for vacant space in the city of Newcastle. The MUBA is designed to highlight titles that ‘didn’t have the sales or recognition they deserved at the time of release’. As previously reported by Books+Publishing, Creating Cities topped its Amazon ebook sales category several days after its launch, while its print book sold around 1200 copies in its first week, which included copies sent to supporters of the book’s crowdfunding campaign. Niche Press specialises in ‘quirky smaller-scale publications that might normally get overlooked by the mass market’, and partners with authors through a ‘shared 50/50 profit/raw cost model’. Read an interview with the founder here.